ww2dbaseAfter the inclusive assault on the German Gothic Line in northern Italy, the Allies spent most of the winter of 1944 to 1945 gathering strength for the subsequent offensive. On 6 Apr 1945, Operation Grapeshot was ordered to commence with 20 divisions, or about 850,000 combat troops, organized under US 5th Army and British 8th Army. Against them were 21 German divisions (some of which were under-strength) and 4 Italian divisions; Axis fighting troops totaled about 400,000.
ww2dbaseBritish 8th Army launched its attack first. On 1 Apr 1945, British 2nd Commando Brigade and Italian partisan fighters of 28th Garibaldi Brigade launched Operation Roast near Port Garibaldi across Lake Comacchio into the isthmus between Lake Comacchio and the Adriatic Sea; in the immediate term, the goal of this operation was to draw German attention away from the main offensive to be launched along the Senio River in a week's time, but in the longer term it was to provide a foothold for a subsequent attack on Argenta. On 9 Apr, after bombardment by 825 heavy bombers and many artillery pieces and smaller aircraft, New Zealand 2nd Division, Indian 8th Division, and Polish 3rd Carpathian Division attacked at dusk, with the New Zealand and Polish troops reaching Santerno River by the evening of the following day and crossing it on 11 Apr. By the late morning of 12 Apr, Indian troops also crossed the Santerno River. With Santerno River crossings secured, British 78th Division and British 24th Guards Brigade began advancing on Argenta. ww2dbaseWest of Lake Comacchio, British V Corps launched Operation Impact Plain after sundown on 10 Apr 1945 to widen the area between the southern tip of Lake Comacchio and Fossa di Navigazione, also known as "The Wedge", expanding the territory gained with Operation Roast. The city of Argenta was situated in the middle of "The Wedge". By 12 Apr, the British troops had advanced four miles westward up the Reno River. In response, German 15th Panzergrenadier Regiment arrived on 12 Apr to reinforce German 42nd Jaeger Division in the Reno River area, followed by the remainder of German 29th Panzergrenadier Division two days later. The arrival of these German troops would frustrate the Allied advances in the Argenta area. ww2dbaseOn 14 Apr 1945, US 5th Army joined in on the offensive, following a bombardment participated by 2,000 heavy bomber and 2,000 artillery pieces. On 14 Apr, US and Brazilian troops of US IV Corps attacked on the western end of the line; on the following day, US and South African troops of US II Corps attacked toward Bologna. ww2dbaseOn 16 Apr, British troops finally crossed the Fossa Marina canal east of Argenta, establishing a bridgehead only 800 meters deep and holding against German counterattacks. With the arrival additional troops, the bridehead was expanded by another 900 meters on the following day. German tanks attempted a counterattack against the expanding bridgehead on 18 Apr, but it was repulsed. German resistance in the Argenta region would be ground away in the following few days, allowing the British to release the tanks of British 6th Armoured Division to make contact with the American column in the Po River Valley at Finale, 40 kilometers north of Bologna on 24 Apr. Bologna had already been captured by this point, entered by the Allies on 21 Apr with Polish troops at the spearhead. Three Allied corps crossed the Po River by 25 Apr 1945, meeting only sporadic resistance and entering some cities and towns that were already liberated by anti-German partisans. ww2dbaseOn 28 Apr 1945, German Colonel General Heinrich von Vietinghoff dispatched a messenger toward the Allies lines seeking a ceasefire. The instrument of surrender was signed on the following day, and it would take effect on 2 May. ww2dbaseThe final Allied offensive in northern Italy suffered 16,258 casualties; it caused 30,000 to 32,000 casualties on the Axis side. 8 Mar 1945 Highly secret negotiations began in Switzerland between Allan Dulles of the US Office of Strategic Services, Colonel General Heinrich von Vietinghoff of the German Army, and Obergruppenführer Karl Wolff of the German SS for the possible early surrender of German troops in Italy. 18 Mar 1945 General Mark Clark established the goal of the Allied offensive in Italy in spring 1945 to be 'to destroy the maximum number of enemy forces south of the Po [River], force crossings of the Po and capture Verona'. 1 Apr 1945 British troops commenced Operation Roast across Lake Comacchio in northern Italy. 3 Apr 1945 Troops of British Special Boat Service and Italian 28th Garribaldi Brigade captured islands in Lake Comacchio in northern Italy. 5 Apr 1945 British 56th Infantry Division attacked German positions near Lake Comacchio in northern Italy. 6 Apr 1945 Allied Operation Grapeshot was ordered to commence in northern Italy. 8 Apr 1945 British troops attacked the area between the southern tip of Lake Comacchio and the Fossa di Navigazione, known as 'The Wedge', in northern Italy. 9 Apr 1945 In the early afternoon, 825 Allied heavy bombers and 1,000 other aircraft dropped bombs behind the Senio River in northern Italy. Between 1520 and 1910 hours, 1,500 artillery pieces bombarded German positions five times. At dusk, New Zealand, Indian, and Polish troops attacked. 10 Apr 1945 New Zealand troops reached Santerno River in northern Italy. After sundown, British V Corps launched Operation Impact Plain toward Argenta, Italy. 850 heavy bombers and 700 medium bombers were used to support the Allied attacks that took place on this day. 11 Apr 1945 New Zealand and Polish troops crossed Santerno River in northern Italy. 12 Apr 1945 Indian 8th Division crossed Santerno River in northern Italy. German 15th Panzergrenadier Regiment arrived in the Reno River area as reinforcement. 13 Apr 1945 British 78th Infantry Division secured a bridgehead at Bastia in northern Italy, across the Santerno River. 14 Apr 1945 British advances in northern Italy were held up at Bastia and the Fossa Marina canal, frustrated by the German 15th Panzergrenadier Regiment. On the same day, after a heavy aerial and artillery bombardment, US IV Corps began to attack on the western end of the German line. German 29th Panzergrenadier Division arrived in the Reno River area as reinforcement; earlier in the day, Adolf Hitler had rejected a request to withdraw German forces north of the Po River. 15 Apr 1945 US II Corps advanced toward Bologna, Italy in two columns along Highway 64 and Highway 65. British troops launched another attack across the Fossa Marina canal east of Argenta, Italy. 16 Apr 1945 British troops crossed the Fossa Marina canal east of Argenta, Italy. 17 Apr 1945 In Italy, Brazilian troops captured Montese. The British bridgehead at the Fossa Marina canal near Argenta, Italy was expanded by about 900 meters. 18 Apr 1945 German 29th Panzergrenadier Division unsuccessfully attempted an armored counterattack against the British bridgehead north of the Fossa Marina canal near Argenta, Italy. 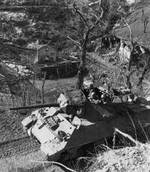 19 Apr 1945 US 5th Army reached the Po plateau in Italy. 20 Apr 1945 US 5th Army broke through German defensive lines and reached the Po River Valley north of Bologna, Italy. 21 Apr 1945 3rd Carpathian Infantry Division of Polish II Corps captured Bologna, Italy with assistance from US 34th Division. 22 Apr 1945 In Italy, US IV Corps and British XIII Corps reached the Po River at San Benedetto and Ficarolo, respectively. 23 Apr 1945 US Fifth and British Eighth Armies reached the Po River north of Bologna, Italy. British Eighth Army captured Ferrara in the process, while the US Fifth Army captured La Spezia. Allied troops captured Bondeno, Italy. 24 Apr 1945 US Fifth Army drove through Mantua on its way north along the Italian coast while British Eighth Army attacked across the Po River and captured Parma. The two columns made contact as British 6th Armoured Division linked up with US 10th Mountain Division. 25 Apr 1945 British V Corps crossed the Po River in northern Italy. 26 Apr 1945 US Fifth Army captured Verona, Italy while Italian partisans took over Genoa and started an uprising in Milan. 27 Apr 1945 US Fifth Army entered Genoa, Italy. 28 Apr 1945 In Italy, British Eighth Army captured Venice and US Fifth Army captured Brescia. German Colonel General Heinrich von Vietinghoff dispatched a messenger from Bolzano, Italy toward the Allies lines seeking a ceasefire. 29 Apr 1945 British Eighth and US Fifth Armies linked up near Padua, Italy, which had just been liberated by Italian partisans who surrounded the 5,000-strong German garrison. Later in the day, German Colonel General Heinrich von Vietinghoff surrendered Axis forces in northern Italy. 30 Apr 1945 US Fifth Army in Italy made contact with French forces near the Italo-French border. On the same day, US troops captured Milan, Italy. 1 May 1945 The US 15th Air Force conducted its final bombing mission in Italy. Meanwhile, German troops in Italy surrendered in accordance with secret negotiations, followed by an announcement for the cessation of hostilities. 2 May 1945 British Field Marshal Harold Alexander accepted the surrender of the Axis forces in Southern Europe. Over 1,000,000 men in northern Italy and Austria laid down their arms. 4 May 1945 US Fifth Army moved up to the Brenner Pass on the Italo-Austrian border. The British 78th Division were amazed when they first met the Friuli Division in February 1945. The Italians had brand new vehicles and guns. The 78th were still equipped with same old trucks and guns with which they had fought across the Western Desert several years before. When Mussolini, at the Police HQ in Milan, was telephoned by a Fascist Journalist with the news that the Allies had entered Bologna and were being greeted with garlands of flowers he is said to have cried out-It can not be true, Bologna is the most Fascist of all Italian cities. He would have been even more shocked if the journalist had known that the Liberating Allies were in fact fellow Italians. When the Friuli Division was formed many of the older officers and NCOs were weeded out to be replaced by younger Anti-Fascist Volunteers. Some arrived in Lorries carrying Communist banners and singing the Red Flag. Most were not actually Communists but knowing that Russia was on the Allied side, thought that they had better show Enthusiasm. Once they were told that they were in the Kings Army they became ardent Monarchists. Hello, My dad was here, he held a bridgehead against German bombardment. My cousins and uncles always said he was the first man across the PO river, but I'm wondering if it was fossa marine. He swam across his name was William Joseph Searle. Royal fusiliers / London regiment, His brother Albert was mentioned in dispatches but, I thing they muddled the two brothers up cause Albert was in tank regiment Salerno. My Dad I was told was mentioned in Dispatches for this bridgehead that he held.